Abstract: Now that the focus of enthusiasts and overclockers has shifted squarely onto maintaining low latency, raw clock speed just isn't as important as it seemed. For memory manufacturers to innovate, and grab our hot little wads of cash, they have to embrace the enthusiast community. For without overclocking, all DDR would be essentially alike. Toss overclocking into the mix and things like CAS latencies, and DDR speeds start to take on a very important role. As with many devices used in computers, there is a tendency to crank up the numbers to make the product seem better.... DDR vs. DDR-2, 4X AGP vs. 8X AGP, 533MHZ FSB vs. 800MHZ FSB... and well, you get the idea right? Thankfully, memory manufacturers have come to their senses, and are focusing more on lower CAS latencies, than simply higher DDR speeds. If you're a long time PCstats reader, you'll know that we have long said that it's counter productive to have high speed memory with high latency speeds. PCstats proved this little tech-tidbit with a dedicated article on the topic, and from the response we've gotten from readers, many of you now see the light as well. Now that the focus of enthusiasts and overclockers has shifted squarely onto maintaining low latency, raw clock speed just isn't as important as it seemed when DDR memory first came out. After all, consider that games and benchmarks don't necessarily need a ton of bandwidth, yet they do require quick access times. 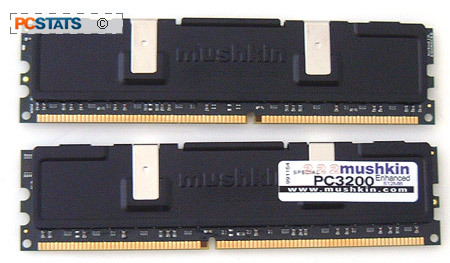 In the following pages, PCstats will be testing out a pair of Mushkin's Enhanced Special PC3200 2-2-2 DIMM's. Each stick is 512MB in size, and when run in dual channel mode that equals a nice whopping 1024MB of system memory. As this Mushkin memory is capable of running with a CAS latency of 2-2-2-5 at 200 MHz (at 2.5V), it means that it will work super-well on both AthlonXP/Athlon64 and Intel Pentium 4 based systems. As you can imagine, it can be costly for a memory manufacturer to ignore the large number of existing AMD users by simply releasing bland, old, high speed, high latency memory. Winbond BH-6 DRAM is well known for its overclockability, and this set of Mushkin Enhanced Special PC3200 2-2-2 DIMM's uses it. The great thing about these Winbond DRAMs is that they not only clock high, but they also tend to run well with tight timings and a modest voltage increase. If you're willing to subject your memory to higher voltages (which really does have the potential to cause damage) you may really be able to get memory built with Winbond BH-6 DRAMs to fly... Of course most motherboards on the market only allow for up to 2.8V which is the maximum safe voltage you can use without dramatically decreasing the life expectancy of your memory investment. After all, the correlation between voltage and memory speed is only to stabilize. Increasing DIMM voltage is not the same as increasing the clock speed or lowering CAS speeds. It does not make your memory work faster (we're stating the obvious I know, but it is often misunderstood), and it's always best to use the lowest possible voltage increase to achieve stability. Bottom line, only use the higher voltages if you're absolutely sure about what you're doing! While there is an official speed difference between Winbond BH-6 and BH-5 DRAM, it seems to be primarily on paper. In terms of timings and scalability, BH-6 DIMMs act almost exactly like BH-5 DIMMs in my experience. If you find some DIMM's with BH-6 DRAM do not shy away simply because it only has an official PC2700 (166 MHz) rating!